Arctic sea ice shrank to its second-lowest level ever, U.S. scientists said on Wednesday, with particular melting in the Chukchi Sea, where polar bears were recently seen swimming far off the Alaskan coast. The story is illuastrated by a picture of a polar bear – as it must be. The bear seems to be drowning in a choppy sea. Unless it’s put down first. The best proof for the ecological disaster we are heading towards is the recently reported case of the nine polar bears that were found swimming in open water at least 60 miles from shore. The sea ice on which they live keeps melting and bears have to swim a longer way to find food. 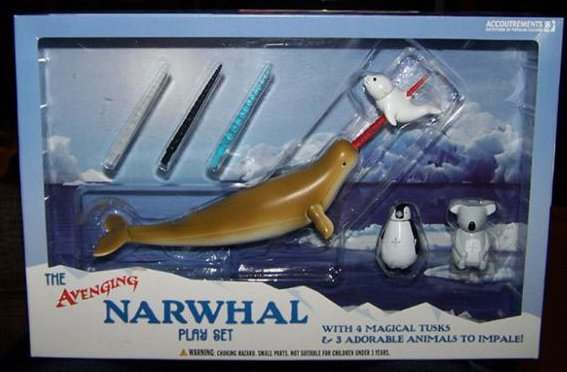 Anyhow, if the polar bears are swimming, they should watch out for the narwhals.